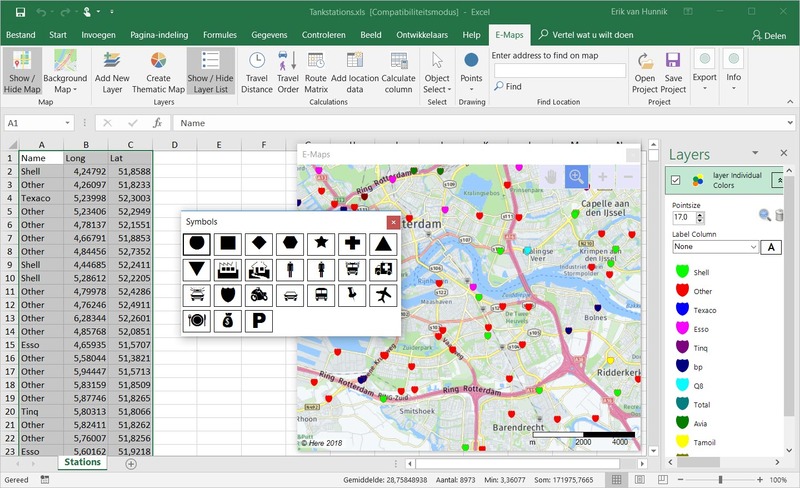 With the release of E-Maps 2.0.4, we introduced symbols for thematic layers. When selecting individual or ranged thematic maps, the symbols on the map can be changed. The symbols will be coloured based on the Individual Name or Range. Check the specifications for all types per version. Would you like to start using the newest E-Maps? Download the update E-Maps 2.0.3.3. To get more insights in your data, we added a statistic feature. 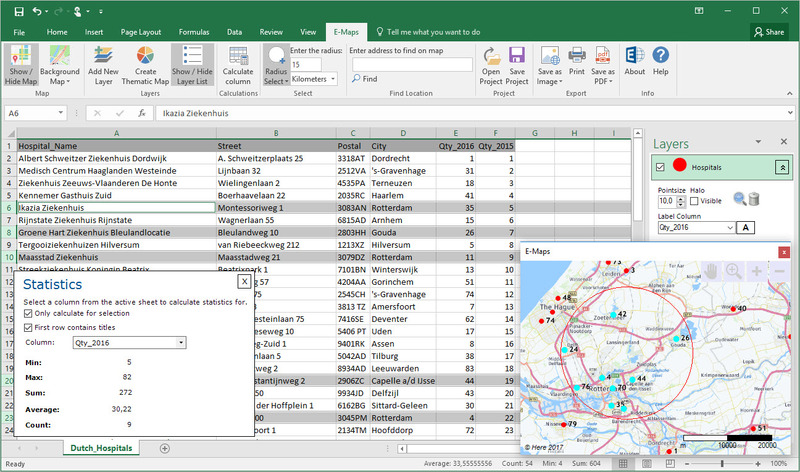 When selecting objects on a map or rows of data in a sheet, you can quickly see the Min, Max, Average, Count and Sum of the data. 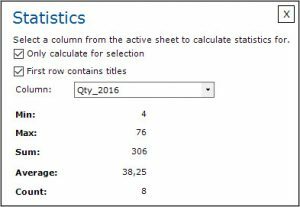 Select a specific column first for the data you are interested in. This function is more advanced than the information given by Excel as a standard in the status bar. 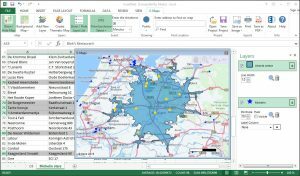 The statistics window is available in E-Maps Advanced and Mobility. From February 2017 First Element added circle selections as standard option in E-Maps Pro, Advanced and Mobility. This feature is added on request of our users. 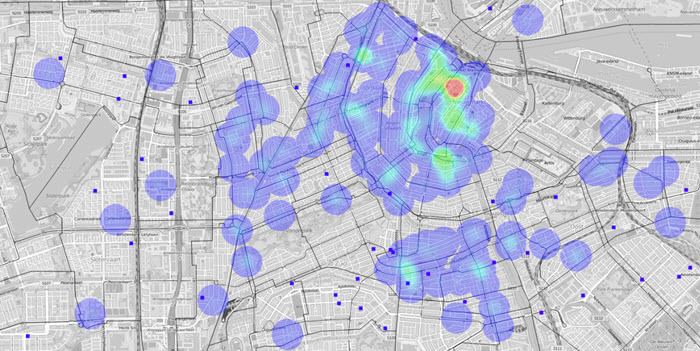 Cirkel selections are useful to have spatial insights around a location. For more advanced selections, you can use the isochrones or isodistance selections. This feature is part of E-Maps Advanced. SHP (Shapefile) is a vector file format associated with a geographic information system (GIS) software program. The SHP format was developed by Esri (Environmental Systems Research Institute) with the aim of increasing interoperability with other GIS software programs. 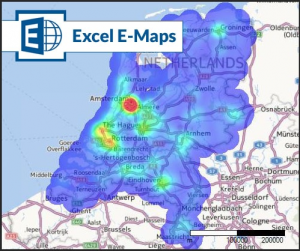 SHP files with polygons (area’s) can be used to create thematic maps in Excel E-Maps. 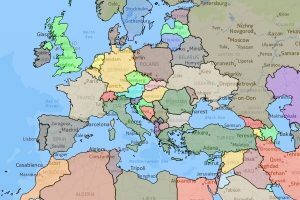 See the tutorial how to import the map and create thematic shading (choropleth). E-Maps Advanced, your start in distance and drivetime analyses. Designed for quick distance analyses, we added radius select, isochrone and isodistance select. These new features give you more insight in geographical selections without the need to buy expensive software. Check our video tutorial on youtube. One of our new customers, Willem van Es (Addwhere Urban Intelligence), did a brief study on the relation of coffeeshops and schools in Amsterdam. 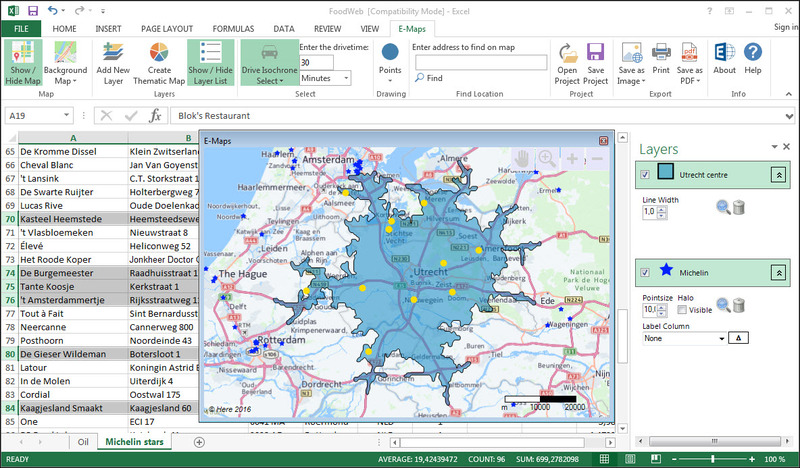 Since 2000 organizations used Microsoft MapPoint for quick geographic insights. The tool had background maps for large parts of the world and for many countries you could geocode. The software and the maps had to be installed on a (network) harddrive. 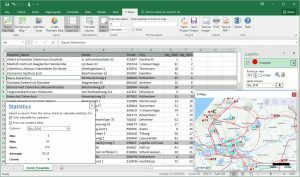 People used MapPoint for quick geographic visualisations and analyses of their own MS Acces or Excel data. In selected countries routing was an option as well. By the end of 2014, Microsoft stopped developing MapPoint. 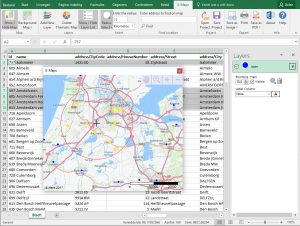 What comes after MapPoint is the easy to use, Excel mapping plug-in E-Maps. E-Maps provides worldwide advanced geocoding, based on address, postal code or city names. 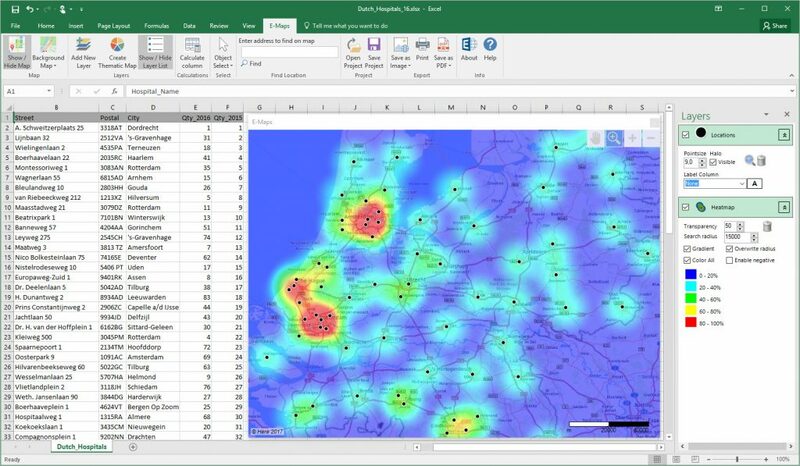 The Excel add-in is the best tool for GEO analysis with features like heatmap, choroplets and other thematic mapping. E-Maps uses the up-to-date map and geocoding engine from Here ™. Isochrones and routing capabilities are available in E-Maps Mobility. Download a free 14-day trial or order E-Maps in the First Element webshop.